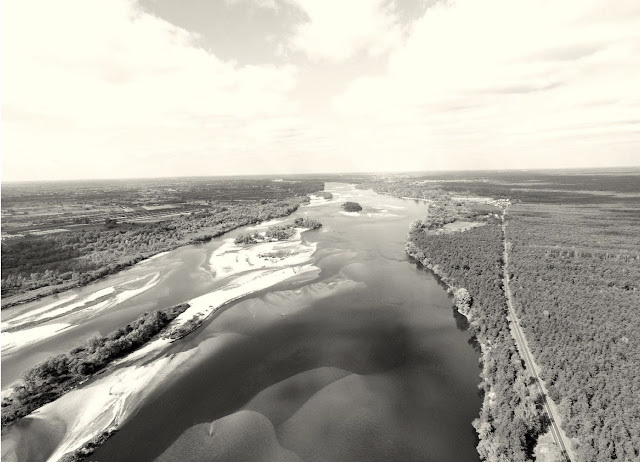 This is one of a possible series of posts detailing a gazetteer of a section of the "Lower Vistula", the stretch of the river *beyond* Warsaw to its mouth at the gulf near Gdansk. I've detailed the second section stretching from beyond Plock to before Torun because it's simpler than the first 100km or so from Praga in Warsaw and I found it interesting as a test of concept. Towns and landmarks: Gostynin, Gostynin-Włocławek Landscape Park, Włocławek Reservoir, Dobrzyn nad Wisla, Włocławek, Kowal, Lipno, Bobrowniki, Chiechocenek, Radziejow, Sluzewo, Chelmza. Description: the upper part of this section of the river consists of the large 2km wide and 58km long Wloclawek Reservoir (Polish: Jezioro Wloclawskie) in the east behind the dam and serviceable lock at Wloclawec bordered on the south by the relative refuge of the Gostynin-Włocławek Landscape Park (see below). Ice build up and ice floes in the reservoir section can be a significant problem in the Winter months, although the last few years since the outbreak of war have not presented major difficulties yet. The further stretch of river below the barrage until Torun conforms to the usual meandering and sandbank prone nature of the majority of the Vistula, but is mostly navigable by larger river ships than the upper reaches beyond Warsaw. Both the reservoir and the landscape park provide the villagers on the southern bank with relative safety from the troops moving through the area, as their large areas make it difficult for troops to harass the civilians who use their river-borne craft or the forested terrain to retreat to. The wide reservoir between Plock and Wloclawek is relatively peaceful and picturesque, with a notable absence of regular troops or marauders other than the occasional lost river pirate boat from the remnants of the Korsarz of Warsaw (see PotV, pages 33-34). 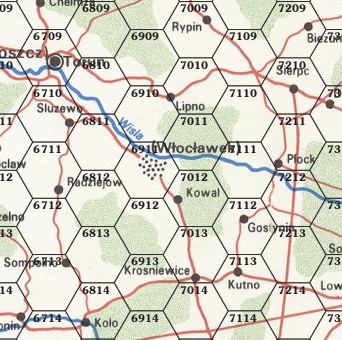 By contrast, the active forces further downstream are the patrols and convoys of the Soviet 96th Cavalry Division stretched along the road south of the river between the ruins of Wloclawec and their base in Torun (shared with the Soviet 22nd Cavalry Army HQ) and to the east along the railroad as far as Lipno. Forces south of the river will initially be on the lookout for remnants of the US 5th Infantry Division, but their interest will have fallen off as Winter approaches. As Winter approaches, the small troop of 300 men from the Soviet 89th Cavalry Division based in Sompolno and the south stop following orders from Torun and begin to move eastwards to ultimately winter in the small town of Kowal. The nearby Soviet 43rd Cavalry Division remains with their attention to the north, based in and around their cantonment near the city of Grudziadz, controlling the two bridges over the Vistula in a face-off with the 2nd Polish Free Legion. This small town of about 200 inhabitants lies at the south of the landscape park on the road from Plock to Kutno and was bypassed by the recent fighting between elements of the US 5th Infantry Division and 1st Brigade and the Soviet 89th Cavalry Division. The wary villagers hunt through the woods nearby and have secreted several small caches of ammunition, supplies and food in preparation for the Winter and a retreat into the landscape park if harassed. If treated with civility they may assist American troops by showing them the paths and camping areas of the park. Like other landscape parks, this area has relatively abundant wildlife including deer, wolves and particularly beavers around the multiple small lakes scattered through the area, allowing for reasonable fishing (and grenade fishing). Like the Kampinos Landscape Park to the east, the woods have overgrown and are now starting to reach up to the nearby towns and ruins. A small network of canals runs through the park, flowing into the narrow Zuzanka Canal that runs parallel to the Vistula for several kilometres, passing through Włocławek and opening into the main river at Port Letni. Encounter checks here result in animals more often (replace one of the Group results with Animal instead), making the park an excellent location for supplementary hunting for food. The largest man-made body of water in Poland, stretching over 40km and almost 2km wide, this artificial lake hosts a small northern branch of the Czolno Lud, the waterborne civilian community of the Vistula. The majority of the two dozen boats are sail powered, although small alcohol powered motor launches form a part of many family flotillas. Moored about 10km downstream of Plock in the centre of the stream is an artificial island consisting of six tow barges with wooden houses and moorings that the river folk use as both a trade hub and neutral zone for discussions. The central barge mounts a modified 82mm Vasilek mortar that has sufficient range to enable shore bombardment as a deterrent against shorebound enemies. This small village of several families (less than 20 people) has retreated from the main town to makeshift dwellings and small fields within the ruins of the medieval Dobryzn Order castle on a cliff overlooking the reservoir just west of the old boating club. The families operate two small sailboats for fishing and trade their excess grain and distilled fuel with their relatives in the northern ranging boats of the Czolno Lud (see above and PotV, p 34-35) and the riverside settlement of Nowy Wloclawec on the outskirts of the ruins of Włocławek further downstream. See Escape from Kalisz, p94 - the scene of the fighting that annihilated the US 3-11 Battalion, the town is mostly ruined, with a handful of embittered and insular survivors returning from the woods to the south where they had fled. It marks the central point of Poland and is not only a major road junction near the was to be future Autostrada A1, but also the junction for the main railway lines (Poznan-Warsaw, Lodz-Torun, and another line leading northeast to Plock) and major passenger and freight rail stations. The agroindustrial park to the east surrounding the military garrison even has it's own rail sidings in reasonable repair. See Escape from Kalisz, p93 - a half-dozen US 5th Division survivors (of the 1st Brigade's 3-11 Battalion) are being sheltered in the town by the villagers, who are sympathetic to the Americans and share no love for the Soviet 6th Cavalry Division's 2nd Battalion that passed through mopping up the US remnants. This old Pomeranian city has lain abandoned and in ruins since the early days of the war, little more than a mass of rubble stretching along the southern bank of the Vistula. The truss road bridge across to the northern suburb of Suszyce, the 620m long Edward Smigly-Rydz Bridge, remains intact and provides reasonable clearance for most river-going vessels. For encounters in the Wloclawec ruins, use the "Moving Through the Ruins" rules from Ruins of Warsaw, pages 9-10, with any Troops representing cavalrymen of the Soviet 96th, and any Marauders being deserters from the same unit. Civilians will be scroungers from the riverside settlement of Nowy Włocławek (see below). 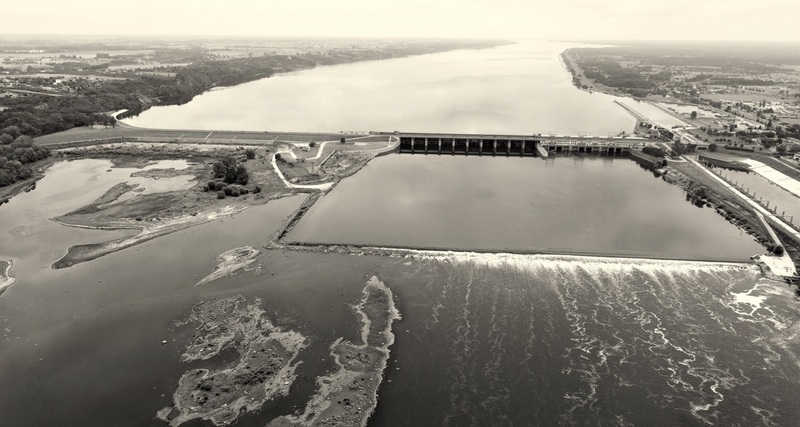 The impressive upstream dam and barrage across the Vistula with its still serviceable lock were completed in 1970. During the initial exchanges when the city was devastated, the hydroelectric plant was targeted specifically and lies with the road broken and the river cascading through the resulting rubble. There is a troop of 15 cavalrymen from the Soviet 96th Cavalry Division guarding the southern end of the bridge, assessing it for whether it can be readily repaired by the division's engineers currently stationed in Torun. Currently the lock is set to the lower level, making passage downstream from Plock impossible without restoring it to working order. The northernmost 26.7 mW hydroelectric turbine may be salvageable with the correct parts (Rare, likely only available in Krakow or similar) and several days of repair requiring multiple skills (FOR Construction, Electronics and Mechanics checks, 2 days spent on each). The lock itself just needs minor mechanical repairs (Mechanic: DIFF, 2 periods) and to be hooked up to at least a 100 kW generator or the turbine to restore it to operational status, allowing large vessels to pass through. Nowy Włocławek is the riverine settlement of survivors near the former suburb of Rybnica that has been established by the survivors of the main city and some of the local militia. Nestled in the ruins of the industrial park to the east of the main city, the survivors have reclaimed fields amidst the rubble in relative safety, surrounded by a dense belt of twisted metal and concrete that acts as a barricade. Scrounging parties from the settlement venture into the western ruins frequently, even as far as the ANWIL industrial park. The formerly exclusive southern suburb of Michelin & Mielcin nestled in the woods is now one of the main staging areas of the rear echelon of Soviet 96th Cavalry Division (1400 men) including a small corps of engineers, stretched out in various convoys along the Torun to Wloclawek road to the west of the ruins. A small detachment of former airmen drafted as infantry when their planes were downed due to fuel shortage is refurbishing the nearby Krusyn-Wloclawek airfield and its Aeroclub facilities with a view to adding the recon capabilities of the half-dozen pre-War microlights cached in the hangars there (see Airlords of the Ozarks, pages 24-27 for details on these aircraft). The pre-War ANWIL industrial park to the northwest has been similarly bombed and shelled into uninhabited ruins, although the rail lines leading from Torun that pass through to the south remain serviceable for the most part and are beginning to see usage by the mostly horse-drawn rail convoys of the 96th. Initially unoccupied in Autumn, by Winter this becomes the camp for the remnant Soviet 89th Cavalry Division that has withdrawn from the area they occupied around Konin, Kolo, Turek and their HQ at Sompolno after the defeat of the US 5th Infantry Division on 20th July. The Americans passed through this town briefly on their offensive but caused little hardship compared to Colonel Mikhaylov's 300 Soviet cavalry and their mounts demanding daily food - the villagers are resigned to waiting out the winter and hope to see the cavalry troop continue their journey eastwards in the spring. Straddling the railway line from Torun to Warsaw, this town of several hundred inhabitants helps provide food for the 96th Cavalry Division based in Torun. The locals have successfully converted the local Miejski Park to fertile fields and have managed to produce excess food to trade. A small detachment of a dozen cavalry troopers from the 96th with a rail-mounted BRDM-4 guard the railway station from which they ship grain to the divisional HQ a day's journey to the northwest, the rail carts pulled by an old BRDM-1 scout car also converted with rail wheels. This small village on the northern bank with ruins of a Teutonic castle near the shore now lies abandoned. Two disused power lines cross from 100m tall pylons on either side of the river, the first set several hundred metres to the south of the village. Although not electrified, some of the lines from the northeastern pylon have broken at the southern end and drape across the foreshore and into the river creating a potential obstacle for propellor craft. The Soviet 96th Cavalry Division has established an observation post near the top of the Bobrowniki tower, allowing the three observers with telescopic equipment stationed here to see almost 30km away to the horizon on a clear day with appropriate equipment - this effectively covers Hexes 6810, 6811 and 6910 ie the whole stretch of river from Wloclawec to Torun and it's suburbs and as far as the town of Lipno and the connecting railroad to the northeast and north. Specific details may be difficulty to make out but troop movements are easy enough to discern. The team have an advanced radio patched into an array at the top of the pylon that reaches to the HQ at Torun and the staging area in the wooded suburb of Michelin to the south of Wloclawec. The observation platform is unarmoured and reached by a single ladder, but does have a PK machinegun mounted on the corner furthest from the river to cover approaches to the post. Now a small town of fewer than 100 civilians on the crossroads of the road from Sompolno to Torun and Wloclawec to Inowroclaw, the town's old hospital acts as the town centre and is still partly functioning through the use of a small generator, although the village is very low on necessary medical supplies due to "donations" to the passing military forces. The nearby Głuszyńskie Lake normally provides excellent fishing, although grenade fishing by the Soviet 89th Cavalry Division on their way south from Torun to the Kalisz area has depleted the local stocks much to the annoyance of the locals. Mostly known through the ages for its curative salt springs, this town of about a hundred villagers now assists with food supply for the nearby Soviet cavalry forces in Torun, its parks converted into fields to supply the troops via horse-drawn rail convoys. In the easternmost Sosnowy Park, a field hospital for the cavalry division has been set up, flanked by the town's old hospitals with only a few MPs stationed as security. 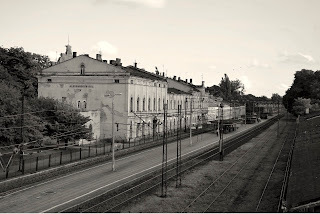 This hamlet of only 3 families about a day's return travel on foot from Torun lies just a short distance southwest of the Aleksandrów Kujawski Railway station and the rail cart convoys of the 96th Cavalry Division. Outside the town limits, stretching for about 20km towards Torun is the old artillery training ground, seeded with many unexploded shells (see page 10 of Ruins of Warsaw for suggested rules for unexploded ordnance) and old wrecked hulls once used for targeting practice. The locals know the dangerous area very well and have several caches hidden amidst the dangerous area. One of the men can lead those willing to pay a price along the hidden path through the fields to the cellars beneath the old Torun Fortress. The Soviet 43rd Cavalry Division has it's rear echelon in this small town on the shore of Lake Chełmżyńskie. With less than two hundred villagers, the town produces enough food to be self-sufficient, although the quartering of the rear echelon troops has put a strain on their stores. Rail carts drawn by horses connect the supply dumps with the force at Grudziadz to the north. Note: details of the Soviet-occupied city of Torun will be presented in a separate section. Very nice work! I am now interested in starting my next game as the "Ghosts of Kutno". The rail-mounted, horse-drawn, convoys as a military supply element is a good one, I guess I'd never made that connection. I wanted to provoke a different option than the default “head to Krakow” option and the potential for interaction with rivers and railways earlier. Torun is still intact so I think will be interesting to develop as a Twilight World city occupied by “foreign” forces as opposed to a free city or half reclaimed ruins. Super cool, the photographs really help give a sense of place. Thanks. I just “sepia” tone them by playing around with the warmth and other settings in Preview or PowerPoint rather than GIMP or anything but I think it gives it the faded post-apocalyptic feel and helps break up the walls of text somewhat. Glad you like it.